The House of Waterford Crystal was delighted to host the 1848 Tri-Colour Celebration. The weekend of the 5th and 6th of March saw the inaugural 1848 Tricolour Celebration take place. The green, white and orange flag which would eventually become the national colour of the Republic of Ireland was first flown by Thomas Francis Meagher at the Wolfe Tone Confederate Club, 33 The Mall, Waterford, on 7th March 1848. The failed Young Ireland Rebellion of that year would lead to Meagher’s transportation to Tasmania, from where he escaped to the United States, going on to raise the Irish Brigade during the Civil War and serving as its Brigadier-General. The international dimension to Meagher’s life was recognised at the 2011 Celebration, with representatives of France, the United States and Canada present. The 5th March saw a replica of Meagher’s 1782 Club jacket presented to members of the 69th Regiment who had traveled from New York to attend the event. They reciprocated by presenting a replica of the 69th New York’s first color to Waterford. The evening also saw a political cabaret, where an expert panel discussed the impact of flags and emblems on politics and nationhood. The main event took place on 6th March when a recital by soprano Donna Roche in Christ Church Cathedral was followed by a flag raising ceremony outside The House of Waterford Crystal. 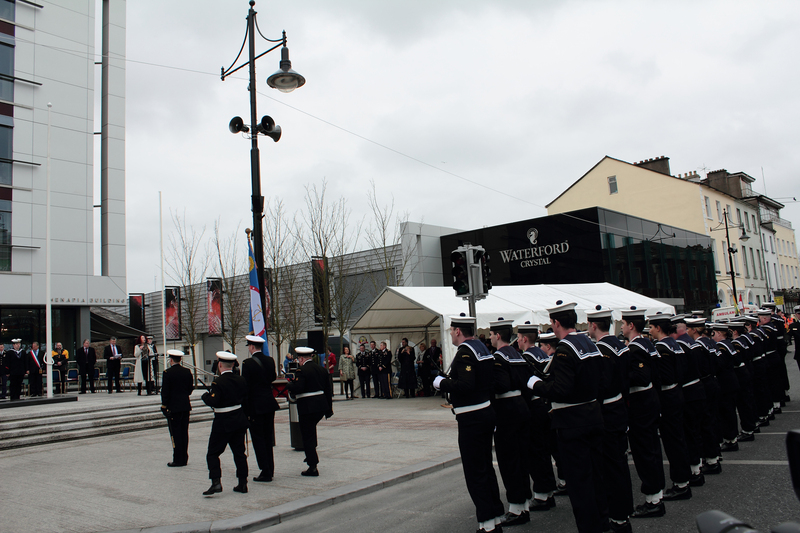 A detachment of the Naval Service Reserve drew up a guard of honour as the Mayor of Waterford Mary Roche addressed the crowd. She was followed by Charles Gautier, the Mayor of Saint Herblain with whom Waterford is twinned, and Canadian Ambassador to Ireland Loyola Hearne (Thomas Francis Meagher’s father had been born in Newfoundland and many Irish settled there in the 19th century). An actor played Meagher for the afternoon and presented the tricolour for the flag raising ceremony, which was followed by the raising of the United States, French and Canadian flags and a rendition of the Irish national anthem. Music during the event was provided by the Barrack Street Band and the Thomas Francis Meagher Fife and Drum Band, and the ceremony concluded with the Waterford Male Voice Choir singing ‘Battle Hymn of the Republic. The event was a great successand hopefully will continue in future years.